Richard G. Scott (1928-2015), an apostle of The Church of Jesus Christ of Latter-day Saints, died on September 22, 2015 due to age. We have a son and a daughter who have qualified to go to the celestial kingdom because they died before the age of eight. That knowledge has given us great comfort (Richard G. Scott, “Temple Worship: The Source and Strength and Power in Times of Need,” Ensign, May 2009, p. 45). Jeanene died of cancer in 1995; the apostle didn’t remarry. 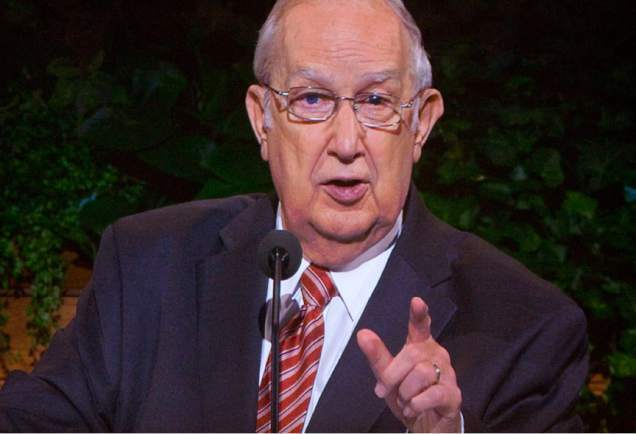 Scott became a member of the First Quorum of the Seventy in 1977 and the quorum presidency in 1983. He then became an apostle in October 1988 at the age of 59. Scott earned a B.S. degree in mechanical engineering from George Washington University and did post-graduate work in nuclear engineering in Tennessee. He helped develop military and private nuclear reactors and was a consultant in the nuclear power industry. Scott’s parents had lived in Washington DC, as his dad worked in the Department of Agriculture under Ezra Taft Benson whose evangelistic influence helped his parents to fully commit to Mormonism; many years later the future LDS president appointed Scott to his position as an apostle. Although he struggled with religion as a teenager, Scott decided to take a closer look at his parents’ faith when his future wife said she would only marry a returned missionary. He later became a missionary in Uruguay. Missionary work is extremely demanding. If you have emotional challenges that can be stabilized to meet the rigors of a full-time mission, you can be called. It is vital that you continue to use your medication during your mission or until competent medical authority counsels otherwise. Recognize that emotional and physical challenges are alike. One needs to do all that is possible to improve the situation, then learn to live within the remaining bounds (“Realize Your Full Potential,” Ensign (Conference Edition), November 2003, p. 43). Scott was known at general conference of stressing the importance of commandment-keeping and the hope to receive all the blessings God intends for those who do what He demands. He is buried with his wife at the Wasatch Lawn Memorial Park. “To be effective and to do as Christ has done, concentrate on this basic principle of the gospel: the Atonement of Jesus Christ makes possible our becoming more like our Father in Heaven so that we can live together eternally in our family units” (“’I Have Given You an Example,’” Ensign (Conference Edition), May 2014, p. 34. Italics in original). “Jesus Christ possessed merits that no other child of Heavenly Father could possibly have. He was a God, Jehovah, before His birth in Bethlehem. His beloved Father not only gave Him His spirit body, but Jesus was His Only Begotten Son in the flesh. Our Master lived a perfect, sinless life and therefore was free from the demands of justice. He was and is perfect in every attribute, including love, compassion, patience, obedience, forgiveness, and humility. His mercy pays our debt to justice when we repent and obey Him. Since with even our best efforts to obey His teachings we will still fall short, because of His grace we will be saved, ‘after all we can do’” (“The Atonement Can Secure Your Peace and Happiness,” Ensign (Conference Edition), May 1997, p. 53). “God’s eternal purpose is for you to be successful in this mortal life. No matter how wicked the world becomes, you can earn that blessing” (“How to Live Well amid Increasing Evil,” Ensign (Conference Edition), May 2004, p. 102). “If you are single and haven’t identified a solid prospect for celestial marriage, live for it. Pray for it. Expect it in the timetable of the Lord. Do not compromise your standards in any way that would rule out that blessing on this or the other side of the veil. The Lord knows the intent of your heart. His prophets have stated that you will have that blessing as you consistently live to qualify for it. We do not know whether it will be on this or the other side of the veil. But live for it. Pray for it” (“Receive the Temple Blessings,” Ensign (Conference Edition), May 1999, p. 27). “Should one live to qualify for all of the richest promised blessings but for reasons beyond his or her control not be able to obtain them on earth, there would be a compensating opportunity in postmortal life” (“Truth Restored,” Ensign (Conference Edition), November 2005, p. 79). “Time and time again at funerals, statements are made that the deceased will inherit all blessings of celestial glory when that individual has in no way qualified by obtaining the necessary ordinances and by keeping the required covenants. That won’t happen. Such blessings can only be earned by meeting the Lord’s requirements. His mercy does not overcome the requirements of His law. They must be met” (“First Things First,” Ensign (Conference Edition), May 2001, p. 9). “The demands of justice for broken law can be satisfied through mercy, earned by your continual repentance and obedience to the laws of God. Such repentance and obedience are absolutely essential for the Atonement to work its complete miracle in your life” (“The Atonement Can Secure Your Peace and Happiness,” Ensign (Conference Edition), November 2006, p. 42). “The priesthood is the authority to act in the name of God. That authority is essential to the fulfillment of His work on earth. The priesthood we hold is a delegated portion of the eternal authority of God. As we are true and faithful, our ordination to the priesthood will be eternal. However, the conferring of authority alone does not of itself bestow the power of the office. The extent to which we can exercise the power of the priesthood depends upon personal worthiness, faith in the Lord Jesus Christ, and obedience to His commandments” (“Honor the Priesthood and Use It Well,” Ensign (Conference Edition), November 2008, p. 44). “Obedience to all the commandments. Full obedience brings the complete power of the gospel into your life with strength to focus on the abandonment of specific sins. It includes things you might not initially consider part of repentance, such as attending meetings, paying tithing, giving service, and forgiving others. The Lord said: ‘He that repents and does the commandments of the Lord shall be forgiven’” (“Finding Forgiveness,” Ensign (Conference Edition), May 1995, p. 75. Italics in original).